Many people see New Zealand’s breathtaking sounds. Few do it on a rail and cruise voyage. New memories await you. Experience all inclusive comfort onboard the Indian Pacific. Discover the beautiful and historic Adelaide Hill. 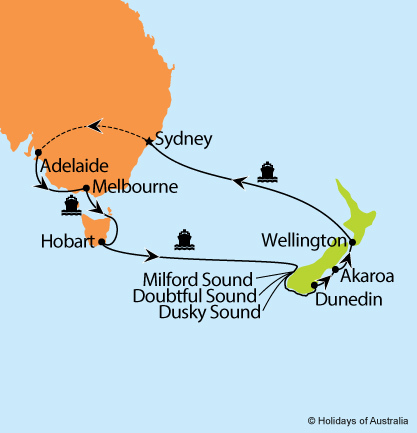 See New Zealand the best way, from your all inclusive journey onboard the Radiance of the Seas. 3 nights aboard Indian Pacific travelling from Sydney to Adelaide in Gold or Platinum Service. Your journey includes all meals, drinks and off train experiences in Broken Hill. Transfer fro the rail terminal to your accommodation. 3 nights in Adelaide at Holidays Inn Express Adelaide including breakfast. Full day Adelaide & Hahnforf Highlights tour. 13 nights aboard Radiance of the Seas cruising from Adelaide to Sydney with port calls in Melbourne, Hobart, Milford, Doubtful, and Dusky Sounds, Dunedin, Akaroa & Wellington. Your cruise includes on board meals and entertainment. ^Save $200 per booking valid on new bookings only until 30 April 2019.